Tottenham stepped up their push for a European place by thrashing Everton. Dean Marney's clever finish and Reto Ziegler's close-range effort put Spurs 2-0 up before Tim Cahill struck for Everton just before the interval. Pedro Mendes ended fourth-placed Everton's hopes of a revival with a powerful drive after 58 minutes. Spurs added further goals through Robbie Keane's simple finish and a stunning 25-yarder from Marney before James McFadden's late strike. Spurs were rampant in an exciting encounter as Everton's miserable record of not having won at White Hart Lane since 1985 continued. Both sides were without key men, with Spurs losing Jermain Defoe because of a knee injury and Everton captain Alan Stubbs dropping out with a back problem. But the absence of Defoe made little difference to the home side. Youngster Marney put them ahead after 16 minutes, lofting a clever finish over Richard Wright after Keane flicked on Mendes' pass. Everton almost equalised via Noureddine Naybet's outstretched leg, but his deflection flew inches wide. Spurs doubled their advantage after 27 minutes when Freddie Kanoute set up Ziegler for a close-range finish. Everton's normally reliable defence was being torn apart, and Keane almost made it 3-0 four minutes later only to see his clever lob bounce off the bar with Wright beaten. Everton gave themselves a lifeline five minutes before the interval when Cahill volleyed home. But their hopes of a revival were snuffed out on the hour, Kanoute setting up Mendes, who turned David Weir and fired high past Wright from 18 yards. Things got worse for Everton after 67 minutes, when Marney turned Alessandro Pistone inside out on the right-flank before setting up Keane for a simple finish. 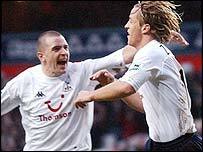 And Spurs continued to run riot, Marney adding a glorious fifth when curling a 25-yard effort around Wright. Everton were well beaten, and McFadden's late goal, his first for the club, was no consolation. Tottenham: Robinson, Pamarot, Naybet, King, Edman, Marney, Pedro Mendes, Carrick (Redknapp 87), Ziegler (Ricketts 87), Keane, Kanoute. Subs Not Used: Fulop, Davenport, Gardner. Goals: Marney 16, Ziegler 27, Pedro Mendes 59, Keane 68, Marney 80. Everton: Wright, Hibbert, Yobo, Weir, Pistone (Naysmith 70), Cahill, Gravesen, Carsley, Kilbane (Campbell 71), McFadden, Bent (Osman 70). Subs Not Used: Turner, Chadwick. Goals: Cahill 40, McFadden 87.